ON loan starlets Nathan Sheron and Alex Samizadeh stole the limelight as this hard-earned victory over Gainsborough Trinity enabled Chorley to close the gap at the top. Leaders AFC Fylde and second-placed Darlington shared a 1-1 draw in Durham, which means Matt Jansen’s men are just four points behind the Coasters. 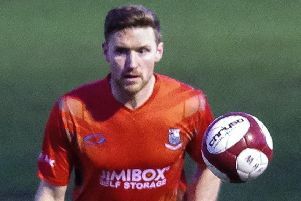 Central defender Sheron from Fleetwood and striker Samizadeh from Bolton Wanderers earned high praise from Jansen after contributing significantly to his side’s win. Samizadeh, 18 on Thursday, having the added thrill of scoring on debut moments after coming onto the field. “Both were outstanding. Nathan’s was a composed performance – he won his headers, put in good tackles and showed excellent distribution too. The Magpies left it late to secure the three points in the last quarter-of-an-hour of a physical and at times hot-tempered encounter. Gainsborough, unbeaten in six at home, were always a threat going forward but Chorley stood up to the challenge and when called upon keeper Shaun Rowley’s safe handling ensured another impressive clean-sheet. There were few goalmouth incidents in a relatively uneventful first half, the nearest either side came to a goal being a Trinity effort which clipped the bar. For Chorley, Adam Blakeman was teed up by Marcus Carver for an audacious 40-yard shot but the ball landed on the roof of the net. Gainsborough enjoyed a good spell of pressure in the second half. Rowley made a fine save to palm away Nathan Jarman’s 20-yards’ free-kick and was alert in dealing with successive corners. The opening goal arrived on 74 minutes when the ball fell kindly in the box for Dale Whitham to rifle home and put Chorley ahead. With less than 10 minutes to play, Samizadeh entered the fray and within two minutes he wrapped up the points, breaking clear on a speedy run and showing great coolness to apply a sublime finish into the corner of the net. CHORLEY: Rowley, Challoner, Blakeman (Beesley,89), Sheron, Leather, Jordan, Roscoe, Whitham, Carver, Walker (Samizedeh,80), Cottrell. Unused subs. Cowan, Azam, O’Keefe. Attendance: 586.